What are you busy rushing around doing now that the “school year” has begun? Are you continuing the same-old-same-old? Waving early morning goodbyes to your little scholars? Or cracking open the books? I’m feeling over the moon to be back at work teaching music to my kiddies again. Oh how I missed them! It’s been a gorgeous, adventurous summer, but I’m ready to say hello the real world work life. Do you ever get that same feeling too about returning to your job? A couple weekends ago, I got together with some of my friends for one last garden BBQ hurrah. One of my girlfriends was on the move to greener pastures, so invited some buddies over for a goodbye party that included homemade burgers (one of the best I’ve ever had) and croquet (yes, our idea of fun!). 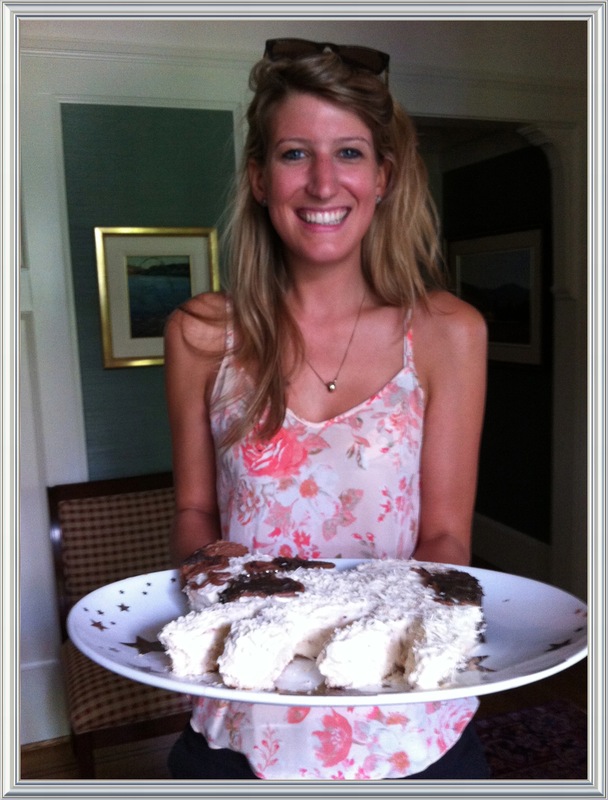 I decided to make her a little going away gift, and what could be better for a BBQ bash than a scrumptious dessert to share? 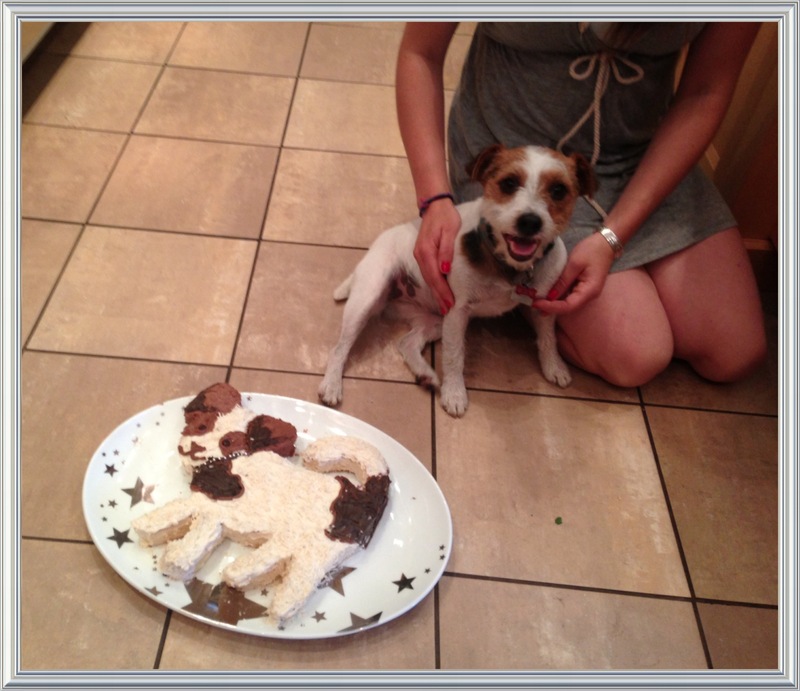 One of my girly’s favourite things in the world is her Jack Russell Terrier puppy, so I decided to make her… a puppy cake! That sounds so wrong.. to clarify, I wanted to make her a decadent yellow butter cake frosted with cocoa buttercream icing, all in the shape of a pup! 1. 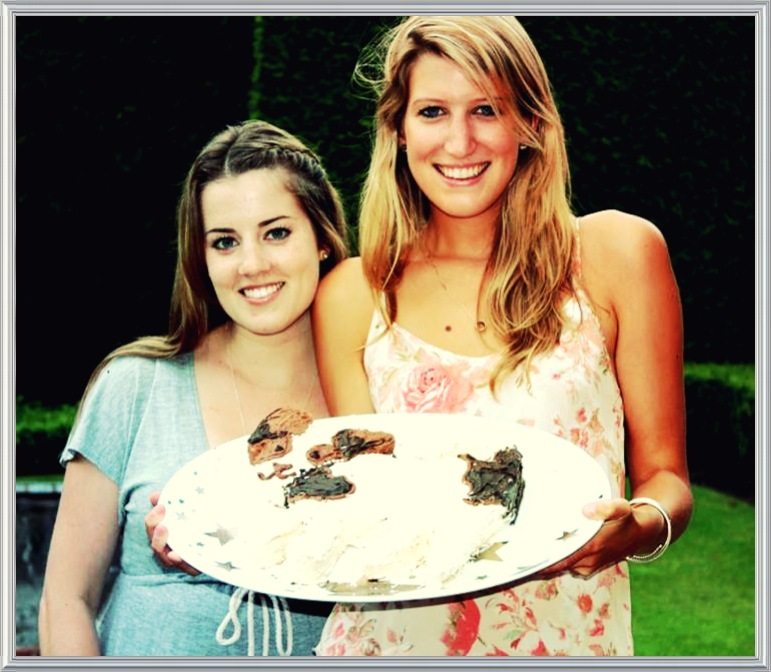 Bake cake in two buttered rectangular cake pans. 2. 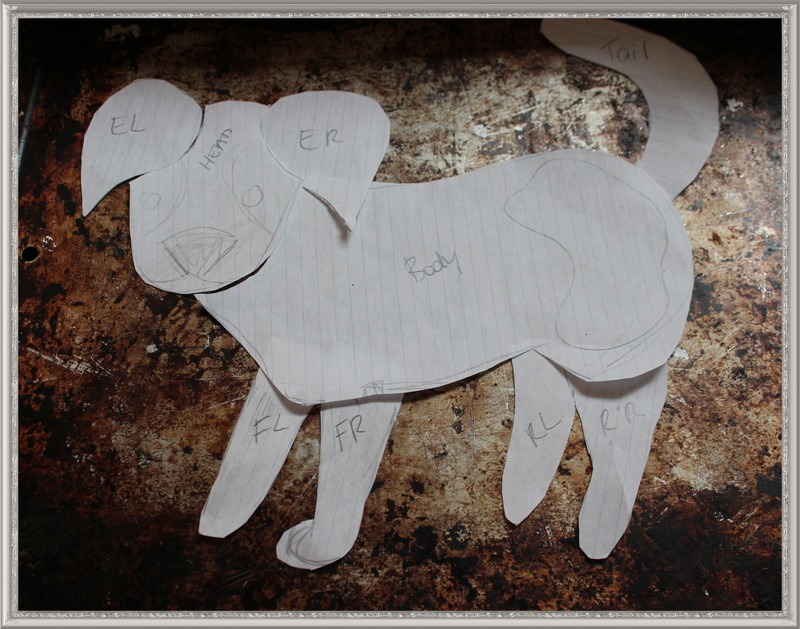 Pencil out a dog drawing on a piece of paper and trace/cut out body parts. 3. Cool cake. Place paper stencils on top of cake with enough space between each stencil . 4. Carefully assemble cake pieces into formation. Make adjustments as necessary to fit the puzzle together! 5. 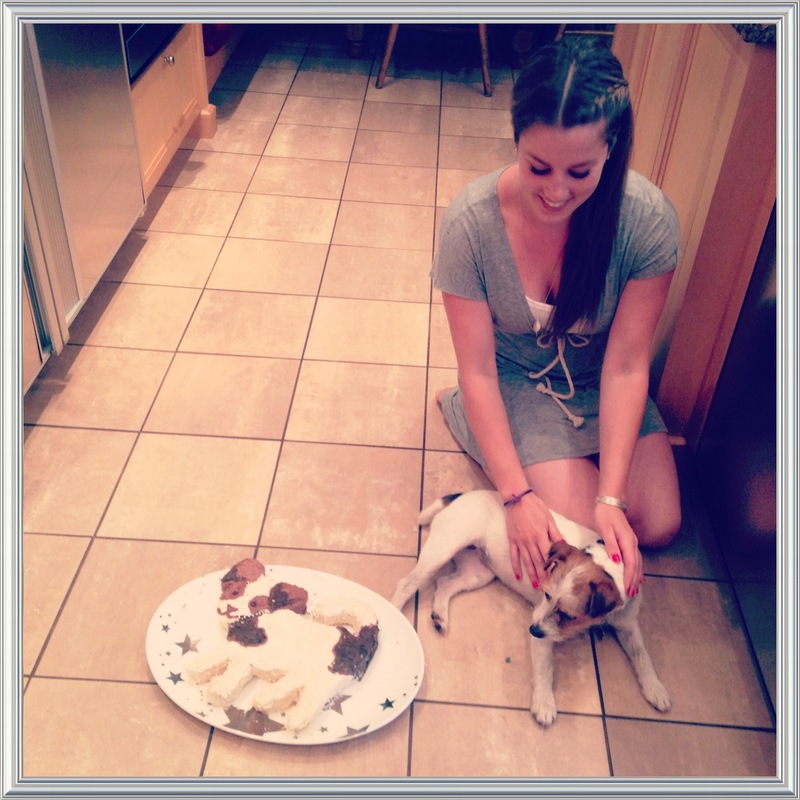 Begin icing cake with the base coat colour of your pup. 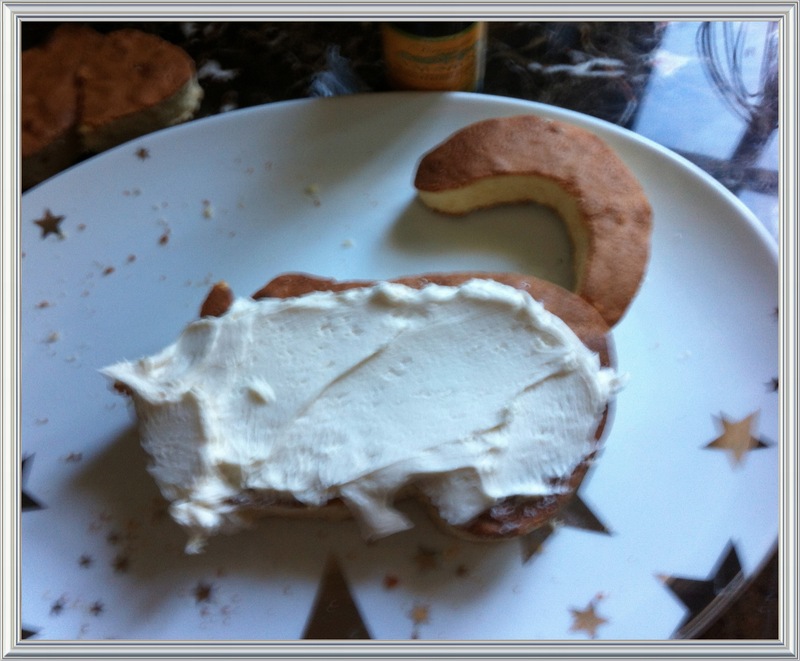 My friend’s puppy was a cream colour, so I began with her body and saved some cocoa icing for her spots. 6. 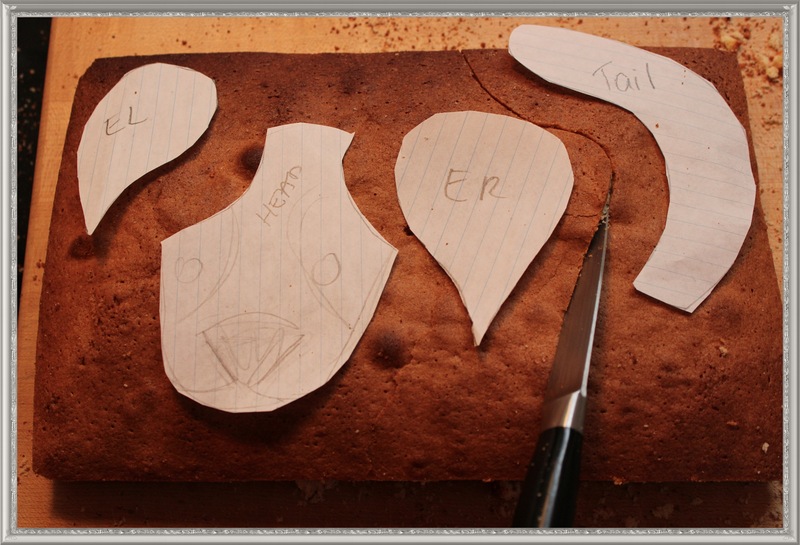 Glue legs/tail/body parts together with the buttercream.With time and care, the little creature will come to life! Yield: Two 9 by 13 inch cakes. Time: 1.5 hours. 1. Preheat oven to 350 degrees. Butter two 9 by 13 inch cake pans and butter, dust with flour. Into a medium bowl, sift together flours, baking powder, and salt. Set aside. 3. With the mixer on low speed, add the flour mixture in three parts, alternating with the milk and beginning and ending with the flour; beat until combined after each addition. 1. Beat butter for a few minutes with a mixer with the paddle attachment on medium speed. Add 3 cups of powdered sugar and turn your mixer on the lowest speed (so the sugar doesn’t blow everywhere) until the sugar has been blended into the butter into a creamy, fluffy form. 2. Increase mixer speed to medium and add vanilla extract, salt, and 2 tablespoons of milk/cream and beat for 3 minutes. If your frosting needs a more stiff consistency, add remaining sugar. If your frosting needs to be thinned out, add remaining milk 1 tablespoons at a time. 3. Divide icing into 2 separate bowls with 2/3 frosting in one bowl and 1/3 saved in the second. Mix 2 tbsp cocoa into the 1/3 portion or until you reach the colour of your preference. 4. Ice cake gently with a small spoon or knife. Try not to pick up crumbs from the cake. Here are some tips. 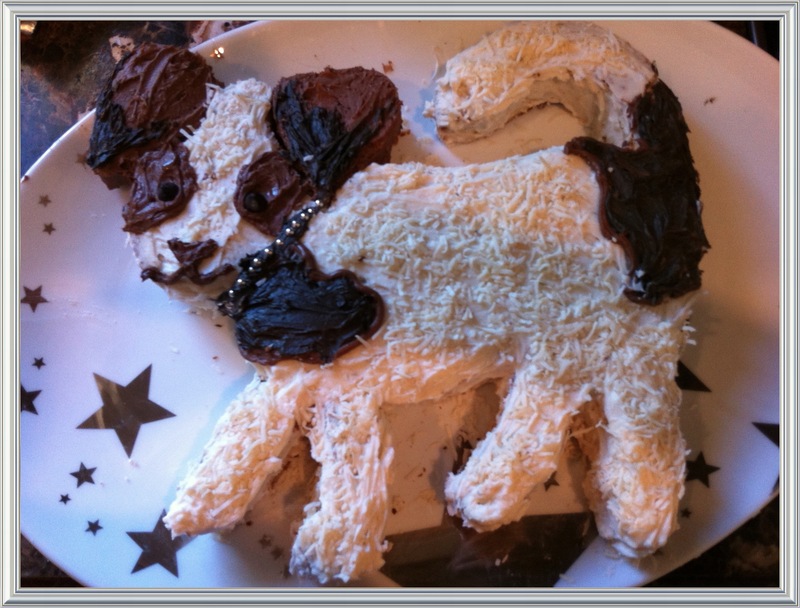 *Hint: Garnish puppy cake with some coconut flakes to give your puppy a fluffy look! And there you have it! I hope you enjoy making this cake yourself! 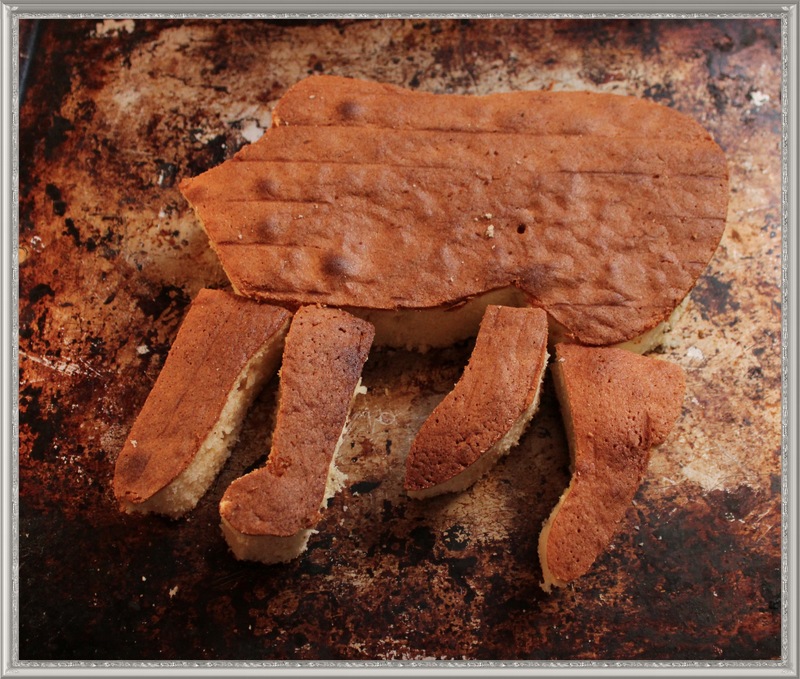 It is fluffy, creamy and delicious in its traditional simplicity. This cake is so much fun and is a great way to bring a special meaning to a certain person’s big day be it a birthday, grad, wedding or going away party! Be creative :) My lady friend loved her gift and I can personally say seeing her smile on her big day made it worth the extra effort to bake this cake for her. 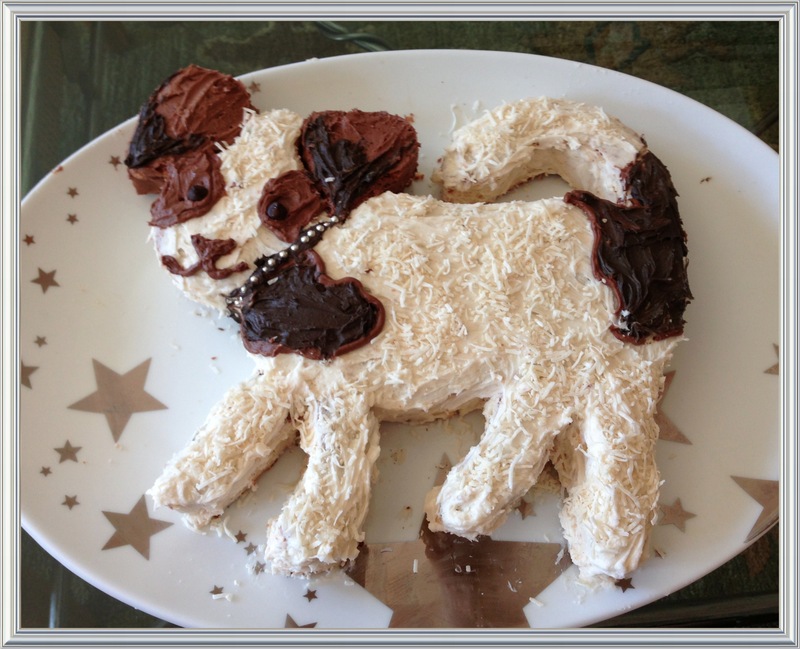 This entry was posted in Baking, Buttercream, Cake, Coconut, Frosting, home and tagged birthday, buttercream, cake, children, dessert, dog, family, frosting, kids, puppy, simple. Bookmark the permalink. Love it heath! One typo though: 3rd para from bottom when ur talking about lisa, “on her big day of” of what? or didyou meanoff? Good one Heather. That cake turned out beautifully. It reminded me of the B-cake book that i used to let the boys choose from when they were young. One year Ivor chose a big pink castle cake. It was from the ‘girls’ section. I never said a word and he loved it. Speaking of hiking…I just explored the trails going up the Mtn above King Edward Estates, today. Of course we got a little lost but found incredible bluffs with many different lichen and mosses. Add to that, a sprinkle of bright fall leaves and some Arbutus tree bark, and it was magical.